Avast is piling on the freebies with Avast 2016 and Avast Mobile Security. PC users who don’t want to pay for a security solution have become used to stitching together various parts: antivirus here, antispyware there, and so on. Avast 2016 combines many of those into a single, free package. And, if that’s not enough, Avast’s Avast Mobile Security has also taken many of its formerly premium features and made them free. Avast 2016 ships in four configurations: Free, Pro, Internet Security, and Premier, ranging in price from $39 to $79 per year, for five devices. The bulk of the free features are available in the free version, with an improved SecureLine VPN service and a better SafeZone browser reserved for the Pro version; the integrated firewall for the Internet Security version; and a secure “data shredder” for the Premier edition. 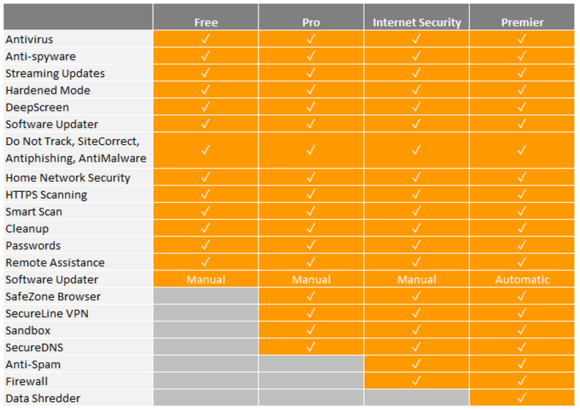 Avast’s feature breakdown for its different editions. The most significant addition to the suite is the new password manager, available in all four versions, including the free edition. Like a service like LastPass, Avast’s password manager encrypts your passwords and stores them on its servers. But the manager also scans for leaked passwords and compares them to yours. It also will automatically delete passwords stored in your browsers. Home Network Security, also a feature of the free version, performs the same tasks on your router—making sure it’s not using the default password, as well as listing all devices that are connected to the network. The new password manager scans your passwords for vulnerabilities. SafeZone, available in all of the premium (paid) versions of Avast 2016, still sandboxes sites in a Safe Zone, and also adds additional layers of protection to banking sites, or the Pay Zone. An ad blocker and a tool to download video from YouTube is also included. Avast promises that the installation and day-to-day activity has also been simplified as well. For example, the Smart Scan feature does it all at once: viruses, software updates, the network security check, and more. And updates will constantly stream in as needed, Avast said—its network can handle more than 36.7 million simultaneous connections across more than 1200 physical and virtual servers. You’ll find a similar complement of products on the mobile side, as well. 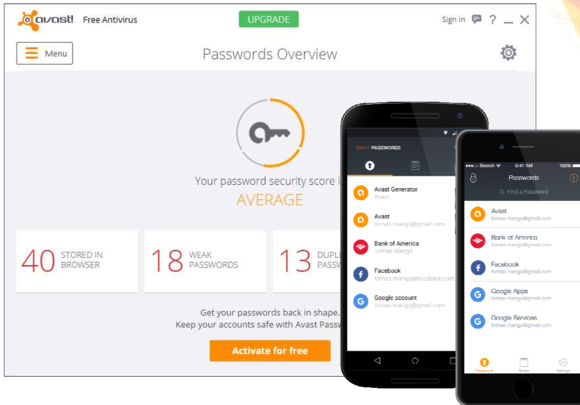 Avast Mobile Security includes such features as a privacy advisor, ad detector, plus aniti-theft protections that include geo-fencing and the ability to take a remote photo of the thief. Avast SecureMe does what the Home Security feature does on the desktop: it notifies you if the router you’re connected to (such as at a coffee shop) is insecure, and automatically ensures a secured connection. The latter features is available just for iOS, however. A related Wi-Fi Finder app, however, will find a safe Wi-Fi access point for you. Avast isn’t perfect, but its ability to detect and block real-world virus samples rated it pretty highly in Av-Comparatives.org’s September test, where it blocked about 98 percent or so of the malware samples. (Kaspersky and Panda were perfect.) Still, there’s more to an antimalware suite than just antivirus, and Avast is putting more under its hood. Correction: The Avast VPN service is known as SecureLine, not SafeLine.